To enter to win Scenery: V for cheVron continue reading! Do you ever want something to add a punch of boldness to your project? 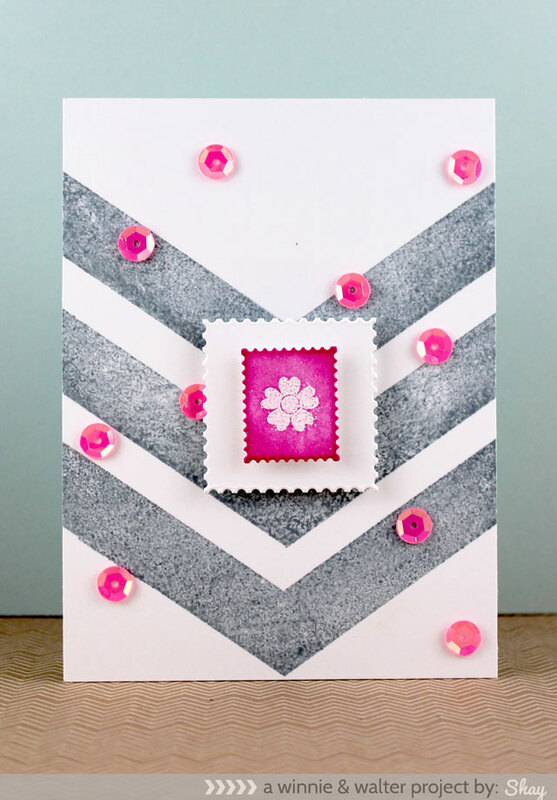 Well we have just the stamp set for you today: Scenery: V for cheVron! 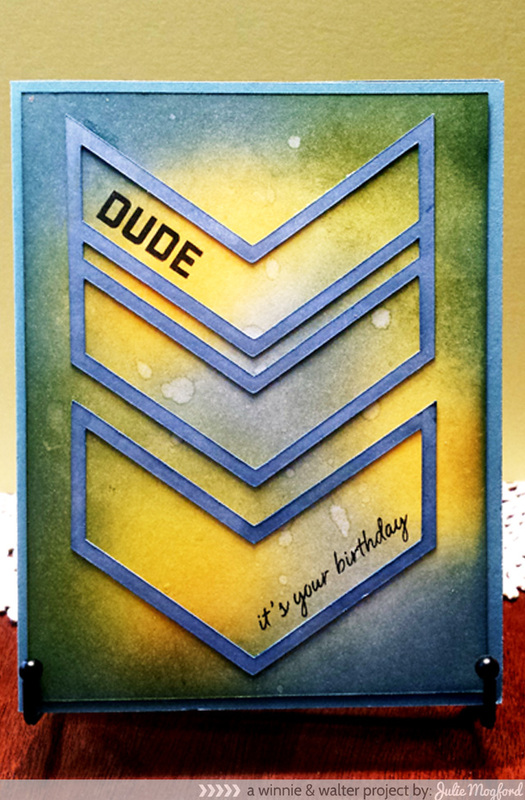 We really mean V because you get two large v's Ione solid and the other an outline) to cover an A2 (4.25 x 5.5 inches) card base with ease or to make big zigzag chevrons on a larger canvas. Then we sprinkled in lots more v's in various sizes and some patterns and designs. If you love chevrons then you are in luck because so are we! My distress inks are getting a workout this week! This card is for my awesome brother-in-law (a little late though). 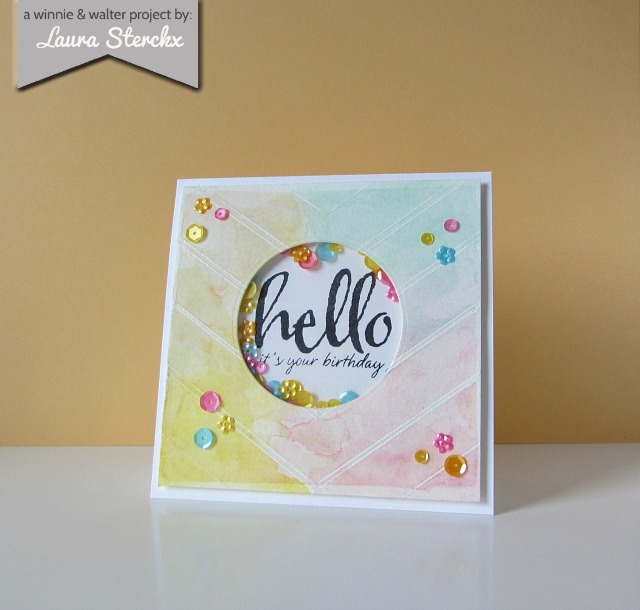 Luscious distress inks are added to the card panel with my new round ink applicators. I added a few tiny sprinkles of water for some interest. I also inked my chevron cut our from the w&w digital files for Scenery: V for cheVron. 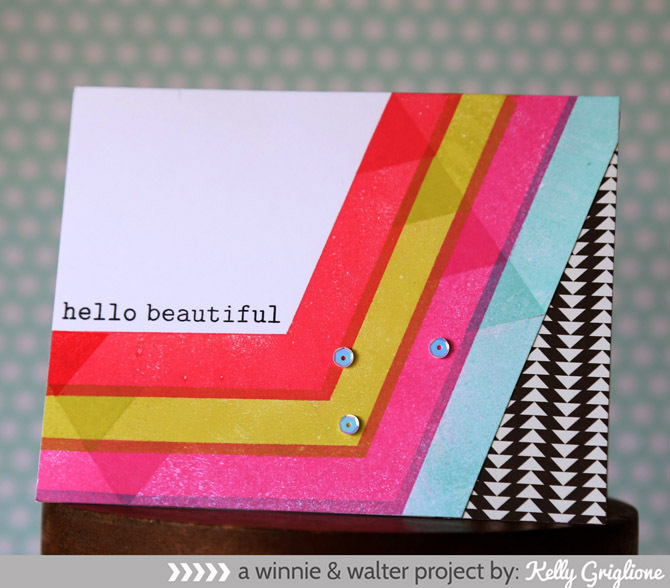 The cut out is glued directly to the panel, and then the sentiments from Bubble Talk are stamped in line with the chevron diagonal in black. Very simple and easy! 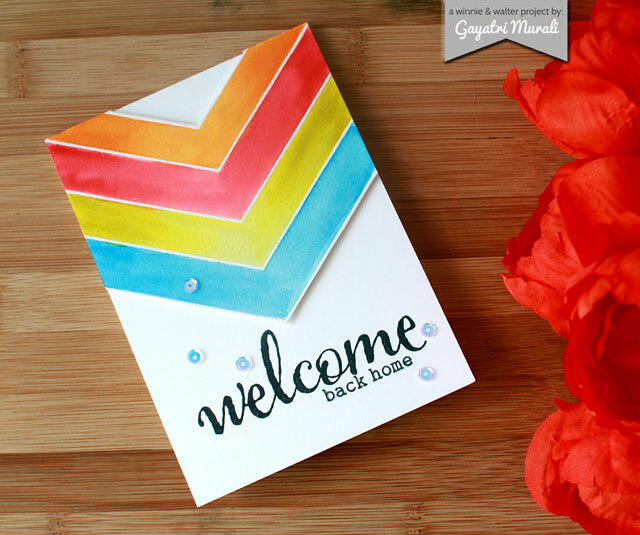 While on Pinterest, I was inspired by this card by Lindsay Amrhein and thought I would try something similar. I kept playing with the files in my Silhouette software and welded two of the chevron images together. I started with a watercolor panel and added some water to the surface, and then with a brush and water, added the colors and let them blend a little before drying. 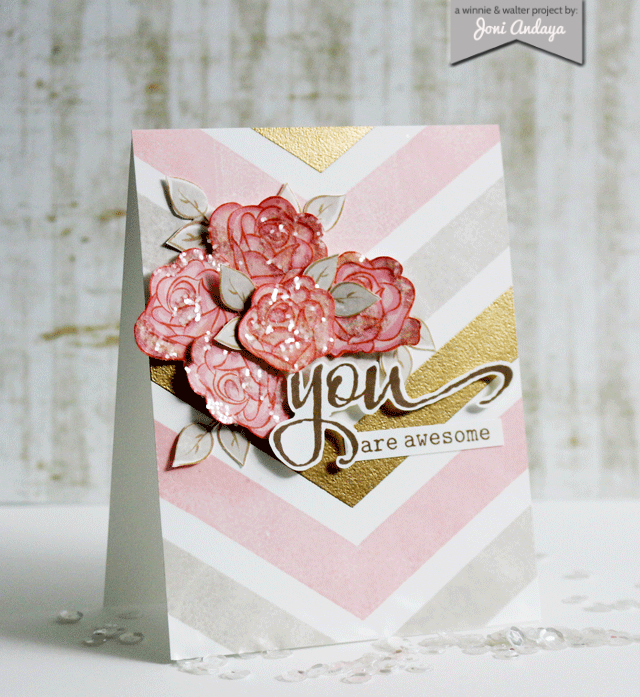 Once dry, I stamped the small solid chevron in random places and embossed with Egyptian Gold EP by Judi-Kins. I love the shade of gold for this EP and the light sparkle it gives off. So fun! I also used it on "you" from The Big, the Bold and You that was stamped on vellum and then trimmed out. The plan was to pop it up, but I couldn't find my clear foam tape, so it was glued on to the surface. The "are awesome" words from the same set are stamped in a coordinating color used for the watercolor. And the final touch, 3 sequins in coordinating colors. Done and Done! Enjoy the inspiration from Shay, our guests Diane and Jenny, and the fabulous Talent - you are in for a treat! Aren't Julie's cards awesome? I love how she incorporates the cut files into her projects. 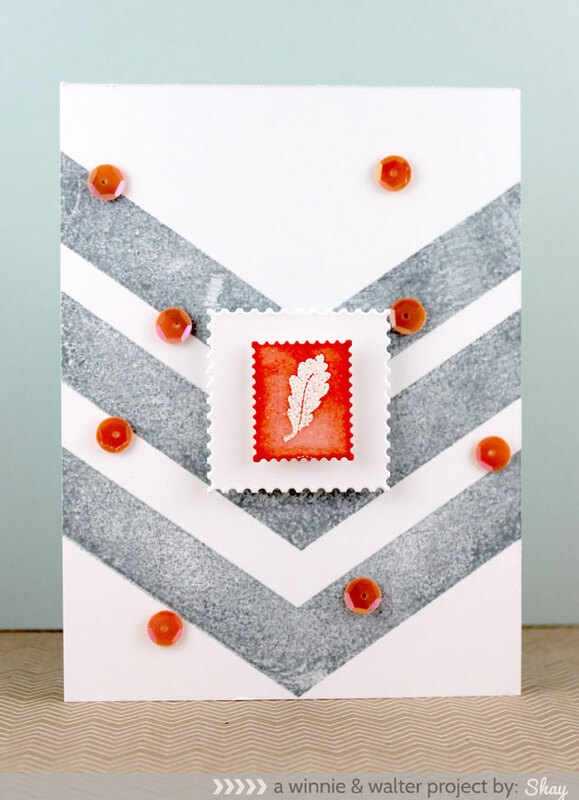 I decided to make another simple quartet of seasonally themed cards this time with the huge chevrons in the backdrop...it is a little less busy than yesterday's cards. lol I began by stamping the large solid chevron 3 times in grey ink on each of the 4 cards. I die cut two sizes of postage stamps dies 4 times each. The smaller die is from Papertrey Ink and the larger from Cuttlebug. On the smaller dies I stamped each of the seasonal icons from The Big, the Bold and Seasons (releasing July 25) in Versamark and heat embossed in white. With Tim Holtz Distress Ink and mini ink blending tool (love, love, love the mini size!) I colored in each of the smaller dies. Spring in picked raspberry, summer in squeezed lemonade, autumn in ripe persimmon and winter in evergreen bough. Next I added the dies to the card using foam dimensional adhesive on each layer. Last, because I had to (compulsion at this point! lol) I added some sequins. As I didn't have a color that matched the evergreen bough, I used an iridescent white which works well for winter. I love every single project you are about to see from our guest stars and Talent. They are so inspiring! 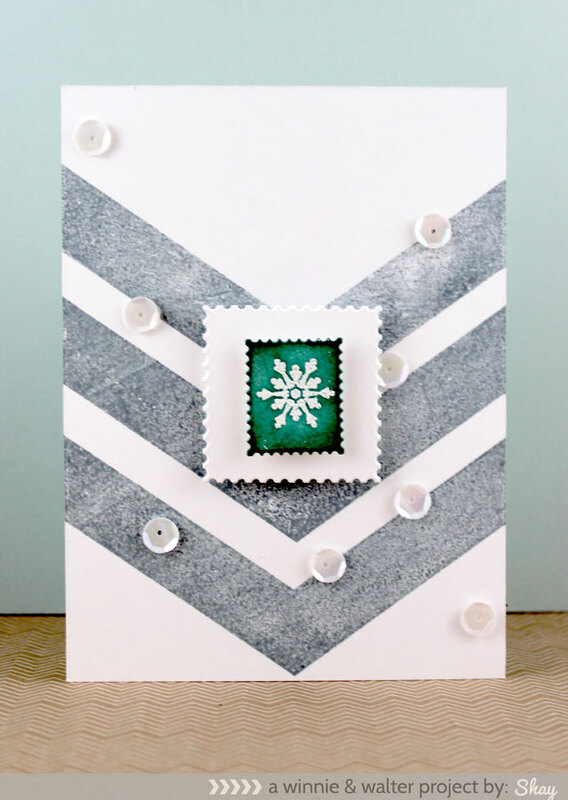 Comment here on this post for a chance to win a Scenery: V for cheVron stamp set of your own by 12:01 a.m. (central standard time) July 25, 2014. One comment will be chosen at random. The V's really make a powerful statement on these wonderful cards. I am so looking forward to the release. Love all these fabulous projects, such a fantastic bold set, very trendy!!! Fun, fun, fun... love chevrons these days. Beautiful sample cards ladies. Some wonderful cards! Looks like a really great set. What a fun set! So versatile! More awesome DT cards again today, love it all! Loving these big bold Chevrons! Wow chevron never looked so good!! 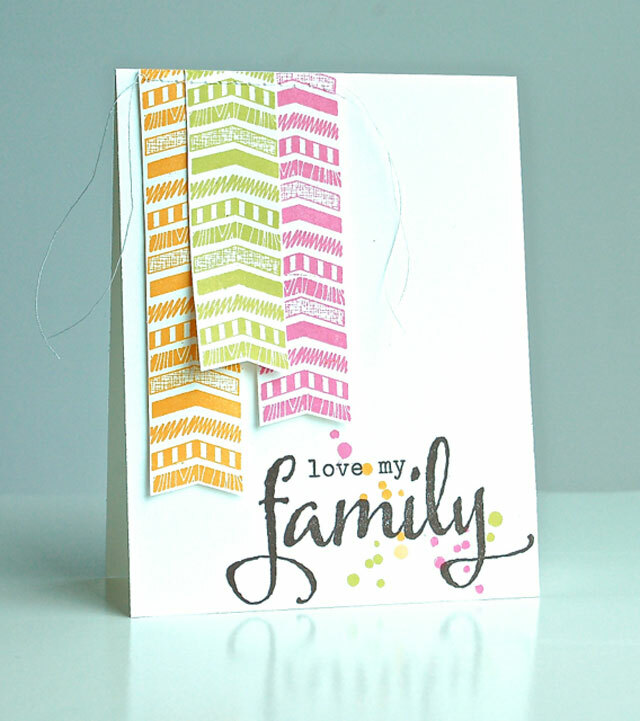 I love the extra large chevron stamp! Another stunning set, and fabulous creations! 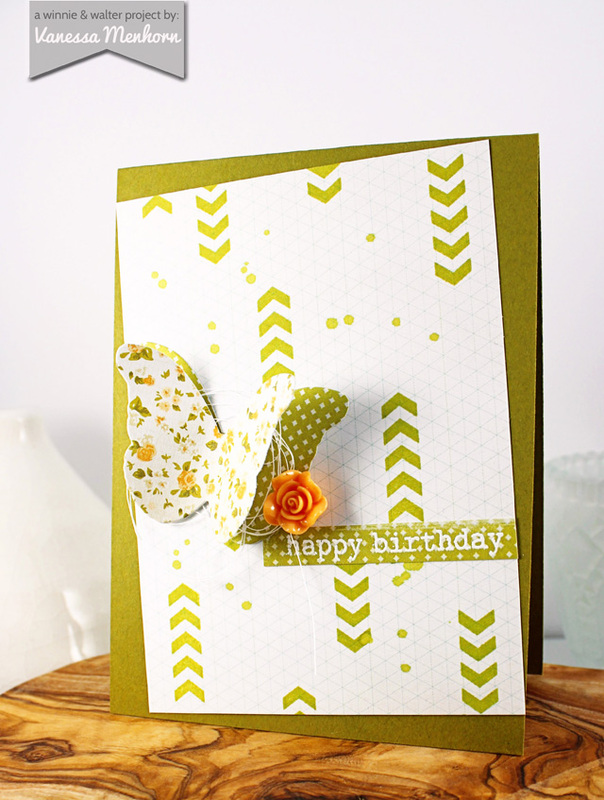 Great set, I am LOVING that big bold chevron stamp! 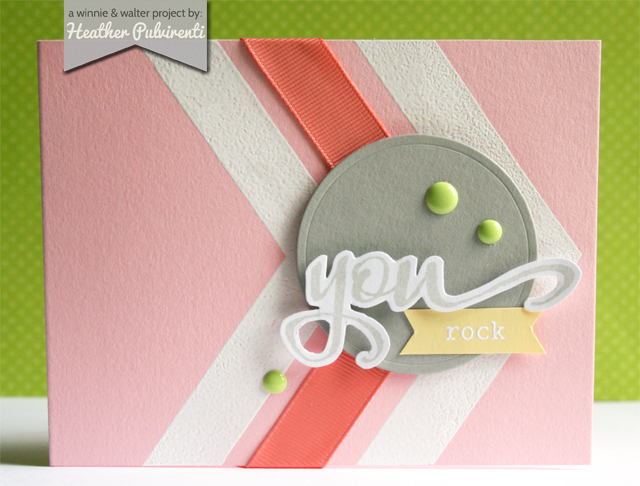 How fabulous your V for CheVron set is - and the DT samples are incredible showcases. V for versatile, indeed! WOW! This set is awesome! There are so many possibilities! I love what the DT has come up with! These are spectacular! Love this set! What a super fun set!! I LOVE this! I love that they are actually chevrons and NOT zigzags!!! The samples are stellar! Love, love ,love this set!!! Gorgeous DT creations!!! Love all the various uses and designs with the chevrons! Fabulous projects thank you for sharing! Fabulous! What a fun and graphic set! All the cards are absolutely beautiful!! Thanks for a taste of the big release to come - love chevrons! Oh WOW!!! Amazing card and another set that looks like it will be a big hit. I also love Chevrons and they are very ON trend!! See you tomorrow for my shopping expedition!! Fabulous creativity from the team with this set! Can't wait to see it and thx for the chance to win! 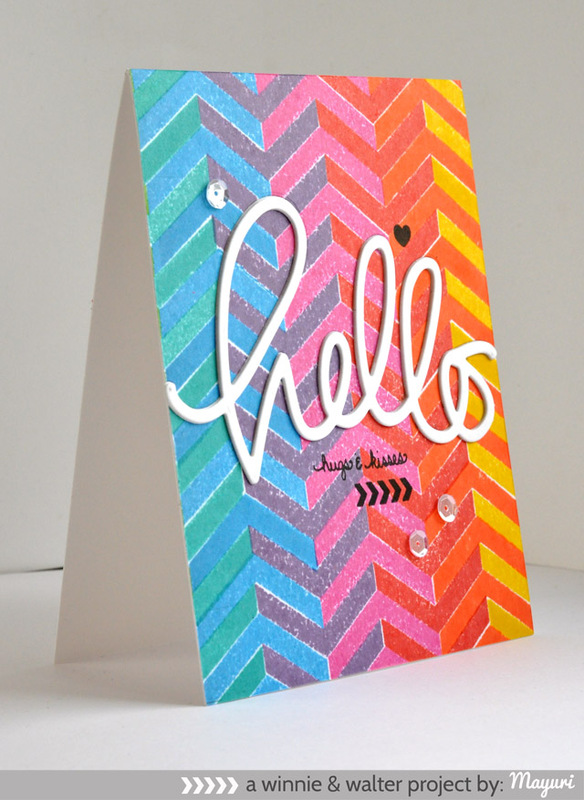 The chevron is so much fun! Love the projects! Chevrons are always great, but these are all fabulous! So wow!! 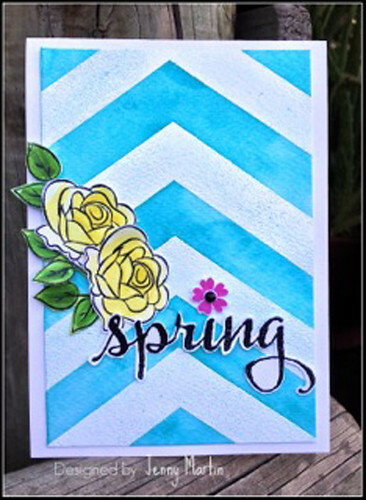 I love this chevron inspiration! That's a great stamp set to add to anyone's stash! Great cards! Love the big chevrons in this set. wow!! so many different uses... love them all..
LOVING the big chevron. I have smaller chevron stamps but this chevron is so bold, graphic and unique. LOVE IT! Love Julie's masculine and feminine cards...always like ideas for the guys. Love the big, bold chevron. It makes a strong statement and it works up into the cards in so many ways. Great set.. Such wonderful sample cards. Can I purchase some talent along with the stamps? Wow! I would never have thought you could do so many things with a v. Fabulous projects! Loving these cards & this whole release! I love the large chevron images! Another day of fabulous samples! Wow, looks like lots of V fun going on. This looks like such a fun set! Such great cards! I absolutely love Laura's shaker card! Amazing cards from the team! 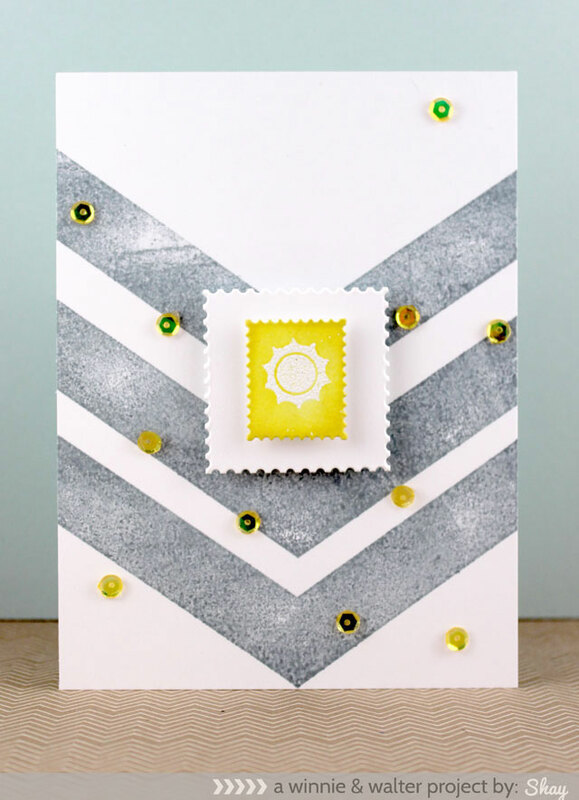 This chevron stamp set looks awesome! This set is way too cool :) Loving the inspiration ! Chevrons are my favorite! I must have it! Really neat stamp set! Love it! I love your new release! Great variety of chevron sizes and designs. Loving all the V's and cards! Talented ladies indeed! Loving this chevron inspirations!! So many different style from your team that make this new release day awesome! WOW - these are THE MOST SUPER COOL stamps!!! LOVE them are ALL and the TOTALLY AWESOME cards they inspired!!! Love the bold graphics! So cool! LOVE it.. I'm so totally hooked on chevron patterns! More AMAZING inspiration from the DT and Guests!!! What an amazing design team you have!! This set looks incredible and would so much love to win!! Nice work of the designers! Love the variety of sizes of chevrons. Thanks for a chance to win! LOVE the big, bold look of the chevrons with a sprinkling of sequins!! !